US authorities knew that an army major accused of killing 13 people at a military base had been in contact with a US cleric sympathetic to al-Qaeda. Intelligence agencies monitoring the e-mail of Yemen-based Anwar al-Awlaki said he had communicated with Maj Nidal Malik Hasan on 10 to 20 occasions. However, it was decided that this did not merit further investigation. US officials say Maj Hasan apparently acted alone in carrying out Thursday's massacre at Fort Hood base in Texas. President Barack Obama is due to visit Fort Hood later on Tuesday for a memorial service for the 13 people who died in last week's shootings. The major, a 39-year-old US-born Muslim of Palestinian descent, was scrutinised by an FBI-led joint terrorism task force because of a series of e-mails between December 2008 and early 2009 with Mr al-Awlaki. If a soldier, a Muslim unhappy about waging war on other Muslims, gets in touch with a man well-known for advocating terrorism, shouldn't that 'raise a red flag'? Mr al-Awlaki, who was released from a Yemeni jail last year, was once an imam at the mosque in Falls Church, Virginia, where Maj Hasan and his family occasionally worshipped. He now runs a website denouncing US policy. It has praised Maj Hasan's alleged actions at Fort Hood as heroic. US officials said the content of the e-mail messages did not advocate or threaten violence, and was consistent with Maj Hasan's research for his job as an army psychiatrist, part of which involved post-traumatic stress disorder stemming from US combat operations in Iraq and Afghanistan. The terrorism task force concluded that Maj Hasan was not involved in terrorist planning. A senior Republican on the House of Representatives Intelligence Committee has called on all the US intelligence agencies to preserve the information they have on Maj Hasan. Representative Pete Hoekstra said in a statement: "I believe members of the full committee on a bipartisan basis will want to scrutinise the intelligence relevant to this attack, what the agencies in possession of that intelligence did with it, who was and wasn't informed and why, and what steps America's intelligence agencies are taking in light of what they know." FBI Director Robert Mueller has ordered a review of how the agency dealt with information about Maj Hasan. Senior US Senator Joe Lieberman has said he plans to open a congressional investigation into whether the shootings were a terrorist attack. Mr Lieberman also said he hoped to determine whether the army missed signs that Maj Hasan may have harboured extreme views. 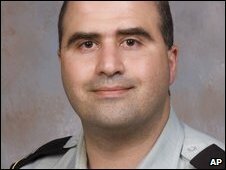 Maj Hasan, who is recovering from gunshot wounds at a military hospital, will be charged in a military court over the Fort Hood shootings. He has declined to be interviewed by investigators. He was transferred to Fort Hood in April and was to have been deployed in Afghanistan, with some reports indicating he was unhappy about this. Bob Baer, a former CIA field officer who wrote the book See No Evil, told BBC News the attack did not "fit the signature of al-Qaeda or any other Islamic group". "Not only there is no motive, there was no claim for the attack. "We are missing so many parts of this. It does look like a man that was motivated by belief, but it looks like an individual act so far." Columnists, bloggers and commentators have expressed their opinions about the news that Maj Hasan had communications with a radical cleric. Hasan was portrayed as a victim of society, a poor soul who was pushed over the edge by prejudice and unhappiness... This response was understandable. But it was also patronizing. Public commentators assumed the air of kindergarten teachers who had to protect their children from thinking certain impermissible and intolerant thoughts. Apparently, the military retained a person who suffered from known (or reasonably discoverable) psychological problems and who attempted to contact an anti-US terrorist group. Meanwhile, the military continues to enforce Don't Ask, Don't Tell and to discharge mentally fit and loyal gay and lesbian service members. Any American who is not prepared to lie to himself has reason to believe that Hasan's religious views were prominent, if not exclusive, factors for why he slaughtered fellow American soldiers. The motives appear as clear as any could be. The politically correct version blames a lonely soldier's personal meltdown, precipitated by the fear of being deployed to Iraq or Afghanistan. The politically incorrect view portrays Hasan, the son of Palestinian immigrants, as a homegrown Islamic terrorist, whether he coordinated with any terrorist groups or not. In the end, it may turn out that both views are correct - in that Hasan would not be the first unstable person to immerse himself in an extremist ideology before he turned his rage on his fellow man.